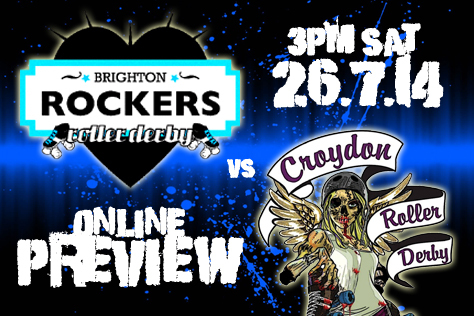 If you missed out on a copy of the the fanzine we produced for the Rockers recent home game against Croydon Roller Derby’s Riot Squad, you can click on the cover above to view the online version. Unfortunately we don’t have enough print copies left to put any in pubs/shops this time around. Huge thanks as ever to all the interviewees, photographers and lovely advertisers. Cheerses. It seems like ages since the Rockers were last in action. In fact that game against Middlesbrough was only ten weeks ago, but this feels like a huge gap given how spoiled we were by three home games in three months running up to it. This Saturday’s match (July 26th) will be well worth the wait, though. It’s arguably the most eagerly anticipated Rockers match-up ever. 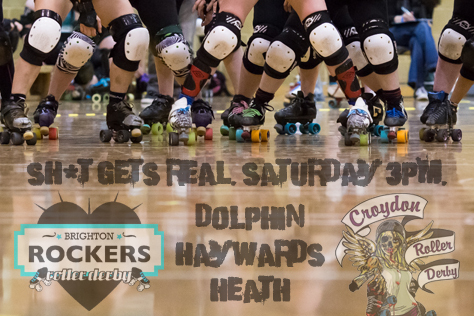 Croydon Roller Derby have already taken Brighton on twice before, but those games were designated as potentially so awesome that the public weren’t allowed in to watch them, in case people in the crowd exploded from excitement. At last suitable insurance and medical provision have been sourced for a Brighton v CRD game to be legally viewable by a paying audience. Yay! As Croydon don’t belong to the UKRDA we’ll have to use the European rankings at flattrackstats to compare the sides. CRD were briefly ranked one place (and 0.3 points) above the Sussex league, but this was due to a mixed team Rockers game in Lille being categorised as A-team, an error that has since been rectified. Brighton currently place 21st (on 647.4 points) and Croydon are up to 26th (632.8). That’s an eleven place jump for CRD since we last checked, which just goes to show how fluid/random derby rankings can be. The site predicts the Rockers have a 72% chance of taking the win, with an expected score differential of 40:31. This would equate to a typical derby scoreline in the region of a 200-155 home win. With the other European rankings sites no longer updating, we have nothing to compare this prediction to. These ‘computerised guesses’ are often spectacularly wrong as they obviously can’t factor in events on the day, player availability and suchlike. Certainly, these two sides know each other well, and a lot of bragging rights rest on the result of the game. Only one league has met both of these sides in open door competition this past year. That’s Central City Rollergirls, whose Ghouldielocks tells us: “Croydon are a tough and dynamic team who are full of surprises, making them a strong side. Brighton are a powerful and established force in the UK and certainly pack a punch on the flat track. If our last meets with these respective teams are anything to go by, then this game is going to be a battle of epic proportions with neither side wanting to concede a loss. I think it will come down to the final jam.” Crikey! We hear you will be retiring from competitive derby after this game. Was that a tough decision and have injuries been a factor? It has been a very tough decision and one that took me a long time to reach. Yes, my injuries did play a large role. I have sustained many over the years, but I was determined to come back from the broken leg I suffered last year. I felt I might have cheated myself had I not tried. This game is the culmination of all of the hard work required to get back to All-Stars level play, and I’m immensely proud of that. I no longer have anything to prove to myself in that regard, and I feel extremely fortunate that I’m able to leave competitive play on my own terms. The Rockers have met Croydon twice before behind closed doors. Presumably you learn more about an opponent’s strengths and weaknesses the more you play them? 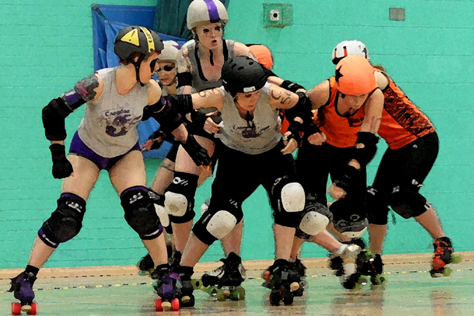 The Croydon Roller Derby Riot Squad are an excellent team who work hard to constantly improve. They’ve come on in leaps and bounds with their performances in the last year. We are quite familiar with many of their long-standing players, but they have quite a few players who have moved up from the B- to A-team that will be a challenge for us. We have made the mistake of underestimating teams in the past and that’s not something that we care to repeat. We’re going to give everything we’ve got for this game! A few Croydon players live in Brighton and CRD have played a couple of home games here at the Dolphin. Will that benefit them? Compared to our other opponents? Possibly only in that they will be familiar with the floor at the Dolphin. However, compared with our last few home games, Croydon will definitely have more crowd support here in the hall, as their fans are more likely to travel with them. Do you have any new tactics or line-ups prepared to counter the Riot Squad threat? You know we’re not going to give away any secrets! We have been working hard on some new tactics and have watched Croydon’s constant improvement in both offence and defence, so we’ll be ready for them. As far as line-ups go, we have our methods to create the strongest packs possible and we’re sticking with that. Care to predict the result? I don’t like predictions, as any team is only as good as they are on the day, but I do think that this will be a hard-fought, close contest and another thrilling game for our fans to watch! CRD have played Brighton in home and away closed doors. Presumably the teams know each other well? Croydon love playing Brighton! These games are always lots of work but also very enjoyable. 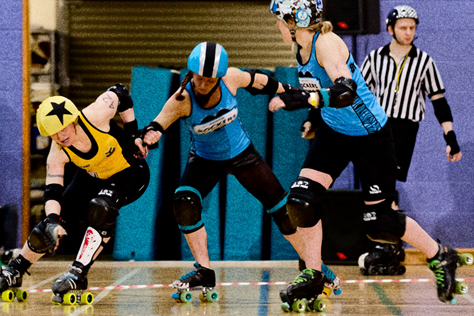 Of course some names are a little more well known around the derbyverse, but what makes Brighton great is that all of their skaters are a formidable threat. Will you be adapting your own play/tactics based on what you learned from previous games against Brighton? Any CRD players the crowd should look out for? We have been working on a few new tactics that we hope to debut in this game. Given how strong the opposition jammers are, we have really been working on our defence. Strong walls are key! As for star players, everyone on Riot Squad has earned their spot on the team, and in my eyes that means they are all ones to watch. Some of CRD live in Brighton and you’ve used this Haywards Heath venue for a few home games. Are there benefits to such local knowledge? I don’t think our Brighton-based skaters could tell us anything about the Rockers we don’t already know, having played them twice. The encounter can be summed up by saying that they are very tough and the game will be super hard. Haywards Heath is not our usual venue, though we have played a couple of games there, so I don’t think we’ll get much of an advantage from that. Would you like to predict the result of the game or after party? We don’t hold too much by the rankings and their accuracy, though we are happy to state that Brighton are a VERY tough team to play. Regarding the game, much depends on what happens on the day. Given the status and reputation of Brighton, as long as we play our best and work as hard as we can, I’ll be happy with the outcome. As for the after party… WATCH OUT EARTH… this could get messy! Many of those attending will know the Dolphin leisure centre well, but for those who don’t the postcode is RH16 1LY and there is a decent sized car park attached. Those travelling by rail should make for – unsurprisingly – Haywards Heath, which by fast train is just one stop from Brighton (13 mins) and two stops from East Croydon (27-30 mins). The venue is about seven minutes walk; turn left on leaving the station and follow the ‘roller derby’ signs stuck to lampposts, trees and small dogs. The Burrell Arms pub opposite the station is OK as townie sports pubs go, with a large back garden should you require a pit stop on arriving. There’s also a large Sainsbury’s store en route to the leisure centre. The Dolphin actually changed hands on the 1st July, moving from Freedom Leisure to DC Leisure. The new owners have promised changes to catering facilities, so apologies if the following information is now out of date. The centre has a cafe bar in the entrance foyer, which does food and soft drinks, but only limited types of booze. There are also vending machines in this area. We personally favour the second bar, which is a few corridor turns past the sports hall. This is small and attached to a health club. It has a strange system where you have to order and pay one side, then take your receipt round the corner to get your drinks. Queues can develop at both outlets, but this ‘secret’ bar has wider booze options (though no food) compared to the foyer one. Be sure to check out the vendors in the hall; particularly the Rockers merch stall, which sees the official launch of various new Rockers branded items, such as badges, keyrings and magnetic bottle openers. There are also a wide range of T-shirt designs, and you have a chance of winning one in a competition the league are currently running on Facebook. To enter, take a photo of yourself by one of the Rockers stickers stuck up around central Brighton and upload it to the league’s FB page. Can’t find a sticker? Check out the BRATS Facebook page for clues to some locations where we’ve spotted them. Also, don’t forget to pick up a free copy of our fanzine Turn Left alongside the programmes at the ticket desk. It’s our most packed issue to date. As well as a four page preview of the game, there’s a guide to the Rockers’ twelve nearest neighbouring leagues, an article explaining how Brighton v Middlesbrough was the first derby match bookies took bets on, plus interviews with Rockers stars current and future. The after party will take place back in Brighton, and as we understand it will be on the upper floor at the Marwood coffee shop (one of the league’s sponsors), which is staying open late for the event. Though traditionally more geared up for queues of foreign students ordering double skinny half-wet decaf recaf iced banana mocha capuccinos, the Marwood does have a booze licence and things will get suitably rowdy whatever the result!